Le Passeur de la Nahanni – Four young climbers dream of climbing the Lotus Flower Tower, a legendary big wall, somewhere in the Cirque of the Unclimbables in the furthest outreaches of Northern Canada. 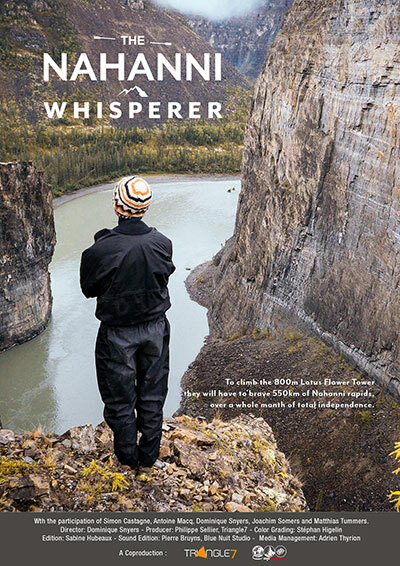 For 800 m of climbing, they will have to face 550 km of dangerous Nahanni river over a whole month of total independence. Given that they have only limited experience in this type of adventure, they persuade Dom, a seasoned traveller 33 years their senior, to help them get this expedition off the ground. Whereas Dom will be fulfilling his teenage dream of riding the Nahanni rapids, he is also about to realise that the Lotus Flower will be his last ‘Big Wall’ climb. A poetic and fun adventure of passing the baton between generations, a point where the dream becomes reality. Finalist – Vancouver International Mountain Film Festival 2018. Best Foreign Film Award – Mountain Film Festival 2018. Grand Public Choice Award – Brussels International Travel and Adventure Film Festival 2017. Official Selections 2018: Maine Outdoor Film Festival, Eho mountain film festival, Vancouver International Mountain Film Festival, Aventures du Bout du Monde, Festival Gorniškega Filma, Killarney Mountain Festival, Mountain Film Festival, Rendez-Vous de l’Aventure, Festival Escales Voyageuses, Festival des Aventuriers. Official Selections 2017: International Travel and Adventure Film Festival, Festival Ecrans de l’Aventure, Rencontres Ciné Montagne, Festival International du Film d’Aventure, Festival Quai du Départ.